I bought one of these from Dixons in the mid 80s. I had originally bought a Casio CZ-101 synth from there, which was sitting in a bargain bin, labelled as a shop demo model. I got the thing home only to watch it start smoking badly before I whipped the power adaptor out of the wall. Upon closer inspection I found that the synth was crammed with what looked like Plasticene. Of course I took it straight back and complained, and strangely they wouldn’t give me a cash refund – I had to take the purchase price in goods. And so I spied the UC2000, plus a few other bits and pieces. I admit that it’s not a design classic. The watch is rather clunky, as is the main keyboard and printer unit. Let’s start with the watch, shall we? Don’t let the writing on the display put you off. The watch (UC-2000) had a metal strap with grey aluminium fascia and grey/orange buttons. As stated before, it was a bit clunky but did its job very well. 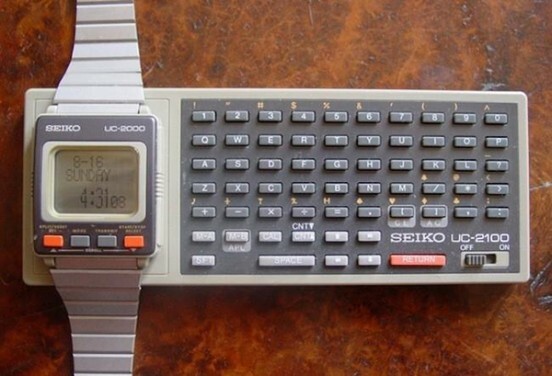 The watch had a 4×10 (50×28 total resolution) block dot matrix style LCD display. The watch also had a stopwatch and an alarm. You had a choice of what to attach it to, the first being the UC-2100. The watch clips into that grey bit on the left, marked ‘Transmission Circuit’. Somehow, data was transferred from the keyboard onto the watch display via magnets or magic (or an induction circuit for those of you who know your onions). You were able to type notes and, I believe, even type BASIC programs. 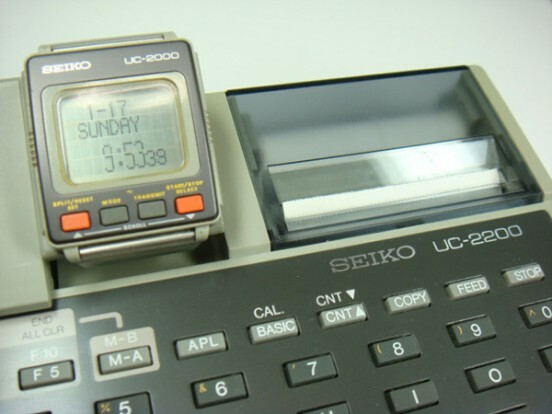 They UC-2100 had a (very) micro QWERTY keyboard with a few other functions, plus a power switch. I’ve seen a few pictures around the net of people believing you attached the watch to this unit then strapped it to your arm, like you were Automan or something. Absolute tosh. There was simply NO way the strap would fit round your wrist with that keyboard attached to it. It barely fitted as it was. Next up is the rather more substantial UC-2200. The 2200 was the Big Daddy component. Comprising a bigger keyboard, thermal printer, ROM compartment and tilting watch dock. 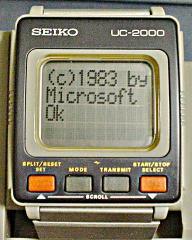 The UC-2200 was powered by three AAA batteries or an optional DC Adaptor. The latter was crucial because that thermal printer was a hungry bugger. It let you print out your BASIC listings or shopping lists. That, I fear, was the limit of its use. The included ROM pack has some games on it, including a horse race program. This was the digital version of Chad Valley’s 1950?s Escalado horse-racing game. You chose a horse (numbered from 1 to four) and I seem to recall you wagered a little bet on which horse won. Completely random of course. You could transfer the game from the 2200 unit (via the magic circuit) to the watch, and carry the game around with you. The bad thing is that the system could only really do one thing at a time, so if you loaded a game onto your watch, the shopping list memo you spent hours typing in earlier was no longer. I was sickened to learn that the system was fetching over £500 on eBay a couple of years ago, and despite it’s total pointlessness, I’m keeping my eyes peeled for another!